The Queen Mary 2 cruise will be a wonderful opportunity to cruise from New York City to London and then to travel by train to Paris. The cruise is fully escorted and includes sightseeing tours at each port of call. Also included are special activities for members of the group. We hope that you can join! Home of Wall Street and Broadway. The most exciting city in the USA! We stay right in the heart of Manhattan and will see the highlights of this fabulous city including the Empire State Building, Statue of Liberty, Little Italy, Chinatown, 5th Avenue and so much more. Follows in the glamorous traditions of the great Cunard Queen Ocean liners of the 1920’s & 1930s travelling between New York and England. The Transatlantic crossing is a wonderful relaxing cruise, with our included private group activities and the daily Cunard program you will be well entertained. Home to the theatre districts of the West End, Westminster Abbey, Big Ben, The Tower of London, Harrods, fabulous shopping, countless museums, superlative art galleries and much more. Home of the Eiffel Tower, the Louvre, Notre Dame, the famous Champs Elysees and the romantic Seine River. We have three nights in this magical city. The Queen Mary 2 is sleek and contemporary with the most advanced technological features and luxurious appointments. The Queen Mary 2 continues the heritage of cruising of the 1930s and the great Queen Mary, Queen Elizabeth, and Queen Elizabeth 2. The great traditions of fine service, food and entertainment continue better than ever. Enjoy the facilities of the gourmet restaurants, swimming pools, the casino, theatres, the cinema, computer and internet access, the Health and Spa Club, seven bars and much more. Take part in the multitude of daily activities that include numerous lectures on an array of topics, the regular musical performances, ship sports and much more. A voyage on the Queen Mary 2 is an exceptional experience to be savoured and remembered. During the day casual clothing is typical, although shorts and swimwear are not permitted in the formal restaurants. During the evening on formal nights, a dinner suit or jacket and tie for gentlemen and eveningwear for ladies is required for the main restaurants. Casual nights require a collared shirt for the gentlemen. The self-service restaurants are casual. About a third of people on the cruise travel alone. 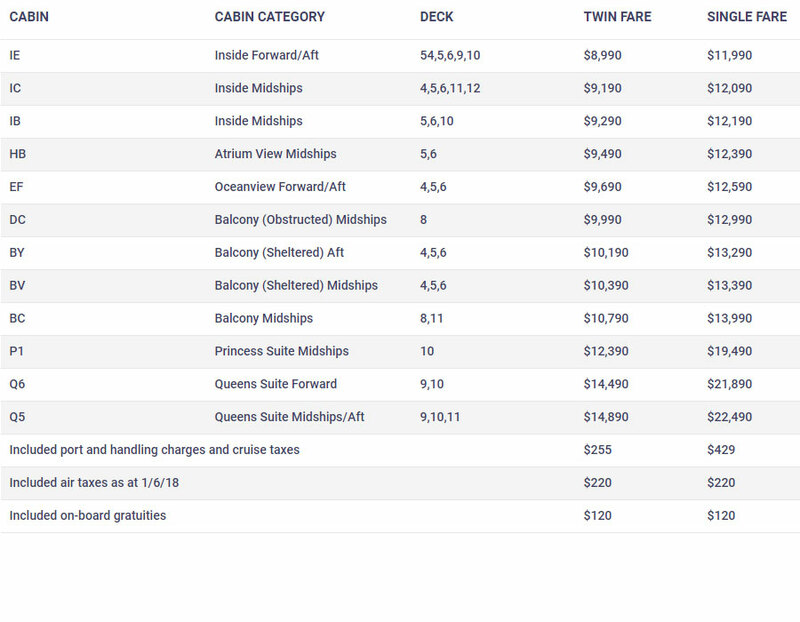 We will match people in twin-share cabins, when available, saving you the single supplement. You won’t be left alone, the Travelrite tour manager will be looking after you – there will be group activities almost every day. Chris Smith has worked in news and current affairs on radio and TV nationally and international for more than 35 years. He has won several awards for reporting and broadcasting excellence. Currently his Afternoon Show outrates all stations in Sydney at this time of day, while he juggles TV appearances on Channel 7’s Sunrise. He is an active host of charity events. His focus on-air is breaking news, but after 17 years hosting his program, he also knows how to entertain and have fun. He looks forward to meeting you and sharing an incredible journey. Today we depart Australia on our flight to New York. As we cross the international dateline we arrive in the early evening on the same day we departed Australia. On arrival we are transferred to our centrally located New York hotel in downtown Manhattan. During our time in New York the Tour Manager will assist those interested in booking tickets to Broadway shows. Join us for an included welcome dinner hosted by Chris Smith. Today is Independence Day. We have a sightseeing tour of New York City and join in the celebrations. We will see the major sites of the city including the Empire State Building, Wall Street, the Rockefeller Centre, Fifth Avenue, Times Square and much more. We will also visit Ground Zero, once the site of the World Trade Centre. The afternoon is free for sightseeing. A walk up 5th Avenue or along the famous Highline Park is an unforgettable experience! This morning we travel by boat out to the famous Statue of Liberty. A gift from the French to American people in 1886 and engineered by Gustave Eiffel, it has been the symbol of the freedom of the USA to immigrants for over 100 years. We then travel to historic Ellis Island where half the population of the US entered the United States for the first time. We will see the route that new immigrants took through the processing room, medical appraisal room and entry room. A free day to explore the sights of New York or do some shopping. Perhaps take the elevator to the top of the Empire State Building, visit the Guggenheim Museum, take a walk in Central Park or perhaps take a cruise around Manhattan Island. This morning will be free for shopping and sightseeing. Early afternoon the group will be transferred to the Queen Mary 2. Early evening the majestic liner will slip her moorings and we will be on our way aboard the spectacular Queen Mary 2 on the route it was designed for, the transatlantic crossing. In the 1920s & 1930s these great ships were patronised by film stars and royalty. Queen Mary 2 follows on from the luxury and glamour of this era. Enjoy the spectacular view of the New York skyline as we depart this wonderful city! Our first day at sea to enjoy the many activities and magnificent facilities on the Queen Mary 2. This evening join Chris Smith for welcome drinks to celebrate our transatlantic crossing. A free day to further explore the QM2 and enjoy the many facilities of the ship. This afternoon join us in a talk from Chis Smith about his life in the media. At sea This morning enjoy a lecture or a show in the QM2 theatre. This afternoon join Chris Smith for a talk about Super Stars of the media. There are so many activities to choose from on the QM2. Why not take some Ballroom dancing lessons, or visit the library and find an interesting book to read up on deck. Why not take a swim in the marvellous outdoor pool or play shuffleboard this morning? This afternoon join Chris Smith for a fun game of Trivia. With so many activities to choose from, why not take in a movie, or have a Line Dancing lesson? This morning we arrive in Southampton. After breakfast, we disembark the Queen Mary 2 and are met by our private coach for our transfer to London. On the way to London we will stop at Windsor castle, venue for the most recent Royal wedding. We will have a tour of Windsor Castle and free time to explore the town. After lunch we continue onto London where we have an overview sightseeing tour of the city before we transfer to our hotel. We will see Westminster Abbey, Big Ben, Trafalgar Square, St Paul’s Cathedral and more. During our stay in London the Tour Manager will meet those wishing to dine with the group to go to a nearby restaurant for dinner. A free day to explore London. Visit some of the many sites in this historic city or enjoy shopping in some of the world’s best stores. This evening enjoy a traditional pub meal, dine in one of the many fine restaurants in the city or perhaps take in a West End show. Today we transfer to St Pancras Station to board the Eurostar train to travel through the “Chunnel” to Paris. On arrival into Paris we have a sightseeing tour of this fascinating city. We will see the Eiffel Tower, the Champs Elysees and the Arc de Triomphe. We are then transferred to our hotel with the rest of the day free. Today we experience the thrill of climbing the Eiffel Tower. We start with a river cruise along the Seine River, a relaxing way to see the sights of Paris from a different angle. The cruise concludes at the Eiffel Tower where we will enjoy lunch at the 58 Tour Eiffel restaurant on level 1. You will enjoy spectacular views from this iconic landmark. Today we travel into the French countryside to the small village of Giverney. We visit the villa and famous gardens of the Impressionist painter Claude Monet. We will see the lake with its water lilies so beloved by Monet and its little Japanese bridge. This evening join Chris Smith as we attend the famous Moulin Rouge show with dinner included. This fantastic show is a stunning mix of glamour and traditional Parisian style. Today the group will be transferred to the Paris Charles de Gaulle Airport for our flight to Australia. Tour members arrive back in Australia. The tour concludes. To Make a Booking or Enquire about this Transatlantic package, Submit an enquiry below.